MOBA announcements have become a bi-weekly affair, such that even the promise of turning the genre on its head sounds tired. But StarCraft, Guild Wars and State of Decay lead James Phinney certainly has the design chops to pull off a game like Gigantic, and a new studio to put it together in Seattle-based Motiga. Players will fight in behind-the-shoulder third-person, and have access to all the abilities that perspective implies – sprinting, dodging and aiming. They’ll pick a class, and then upgrade their characters during the course of multiplayer battles in which each side will attempt to put down an AI beast while defending their own. 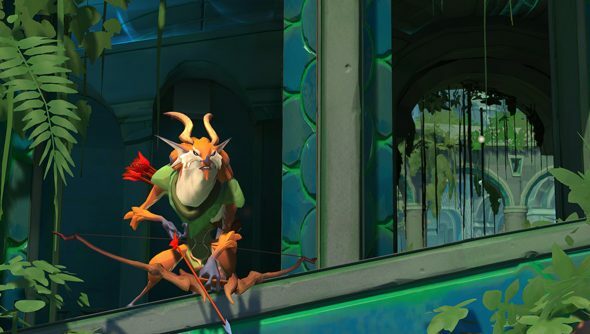 A teaser trailer proves Motiga have a distinctively uncluttered aesthetic and the necessary variety of champions – and shows off the sheer scale of the monsters players will be guarding. Chung knows something about that: he was formerly CEO of NCsoft in North America and Europe, and chief strategy officer at Rift types Trion Worlds. Sign up for Gigantic’s alpha on its official site. Do you think you could give a game like this big, big love?